The X Factor boyband will release their first album just before Christmas and told the Daily Star about their connection with Jason. Jaymi Hensley, 23, said: "Jason Derulo wrote one of the songs on the album and we're hoping to do a collaboration with him. "It's pop music but there's some stuff that people wouldn't expect. There's some funky summer vibes, some dance music, some ballads and a Californian vibe to it. We've got some rocky stuff on there as well, and there might be an extended version later depending on how well it does." The band had a top five hit with Carry You and are releasing new single Beautiful Life on October 21. Jaymi added that One Direction were still a big inspiration: "Without them we wouldn't be here. They are who you look up to." 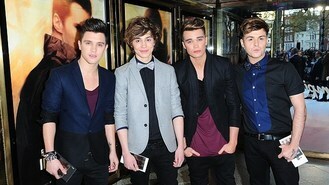 JJ Hamblett, 25, agreed: "We'd love to be at the Brits and win an award and for One Direction to win one at the same time. That's our dream."